No one can resist the call of the sea, the pull of the sand, and the airy freedom that comes with summer beach vibes and sunny homes. 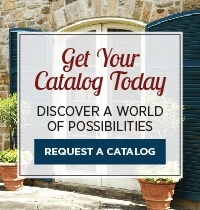 Browse our gallery of some of our standout favorite tropical homes and shutters complete with colors of the sea, custom cutouts, and beachy Bermudas. 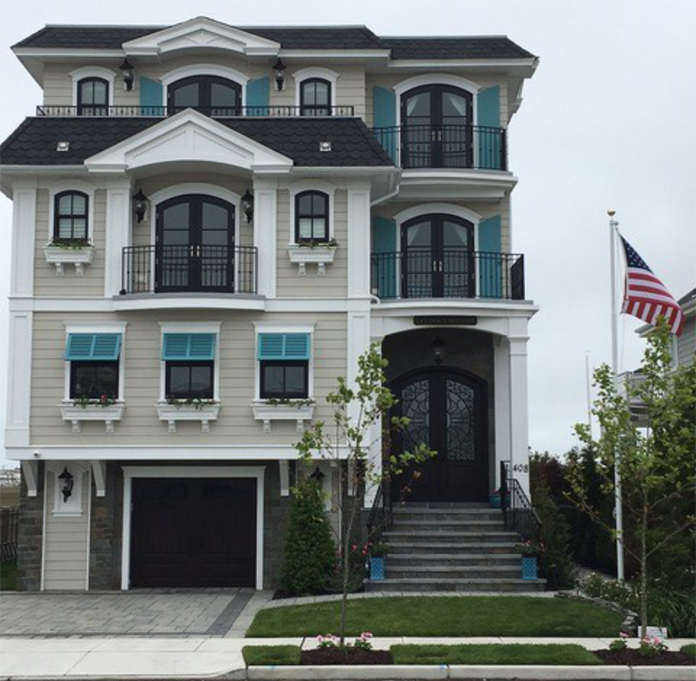 This sleek, attractive design is perfectly completed with Blue Topaz Bermuda shutters, a great choice for tropical settings. 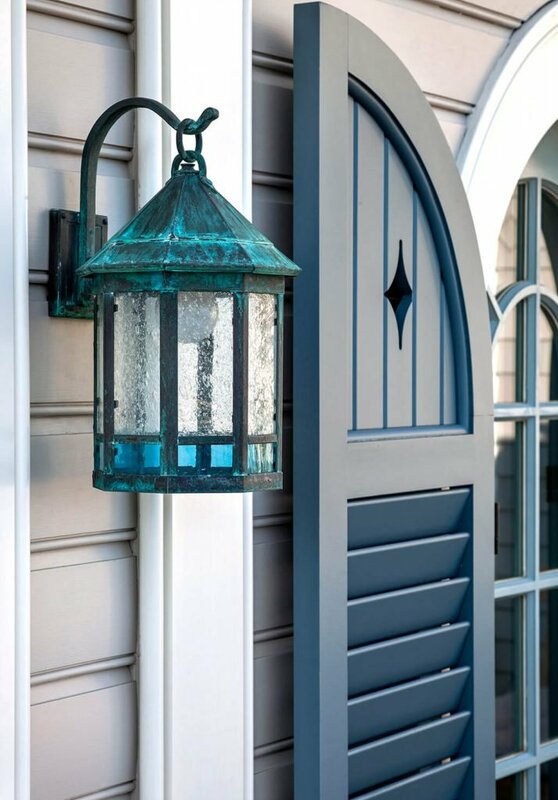 This radius top shutter features a V-groove top panel with a diamond-shaped cutout and louvers on the bottom—and it looks incredible hanging beside this pretty blue lantern. A tropical paradise like this is well-suited for the benefits of Bermuda shutters, allowing slight sunlight with lots of breeze. 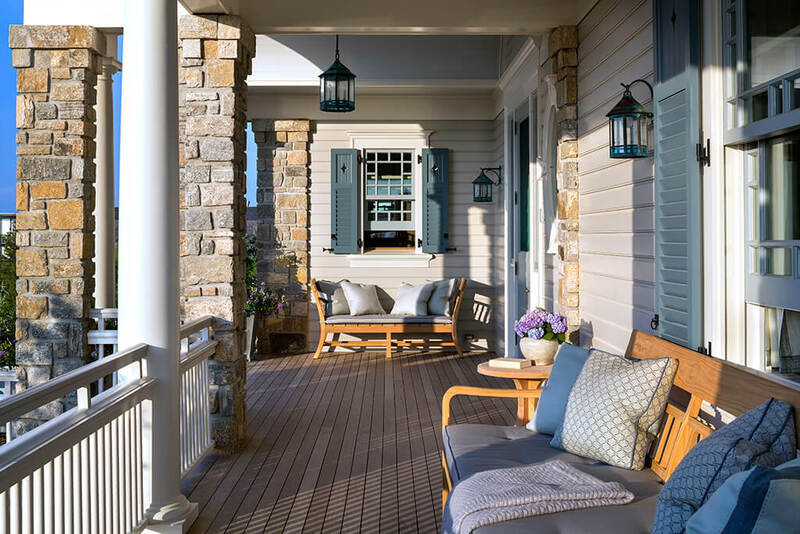 This serene porch view features classic blue combination shutters with fixed louvers on the bottom two thirds and a flat, v-groove panel on the top third, decorated with a diamond-shaped cutout. The poolhouse is completed with full-length, radius top door shutters sporting a 3-sectioned louver set on the bottom and a flat panel with v-groove and diamond cutouot on top. 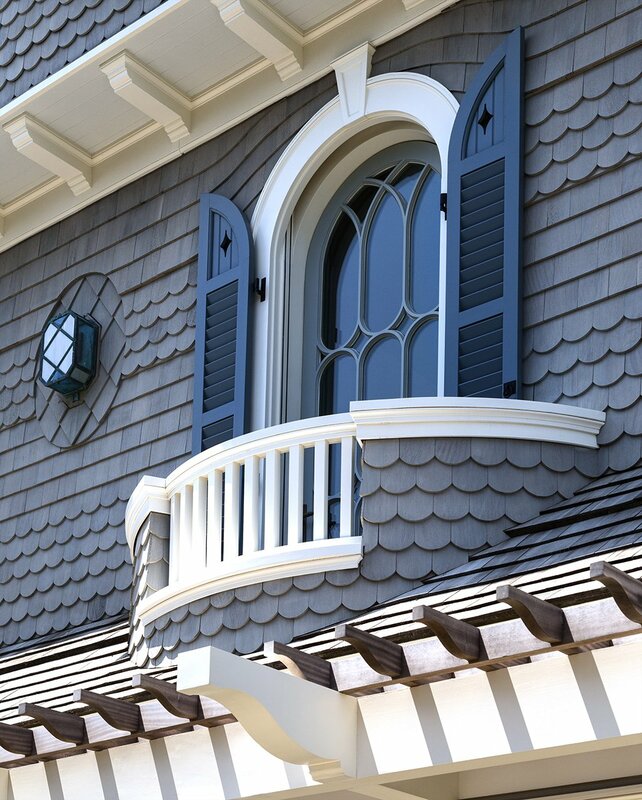 This charming lookout is dressed in customized combination shutters with v-groove flat panels at top and fixed louvers below. 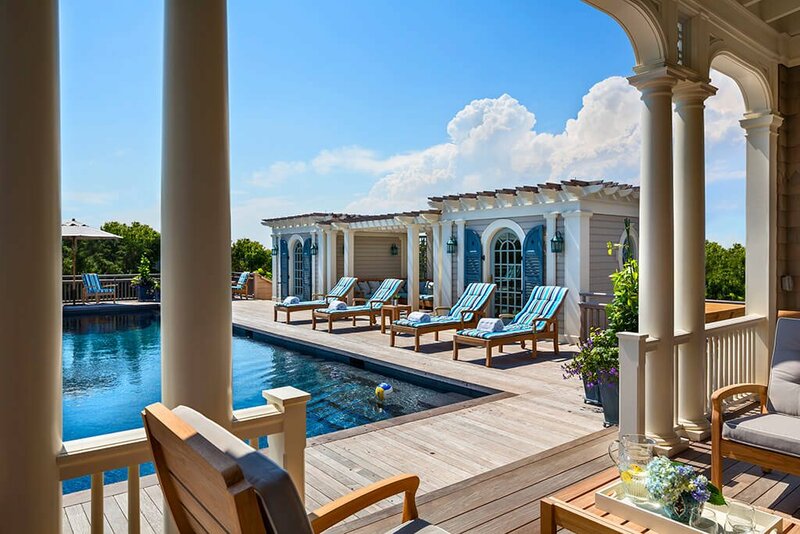 This splendid ocean home hosts a variety of shutters in custom shapes and sizes, but all are clearly part of a unique set. 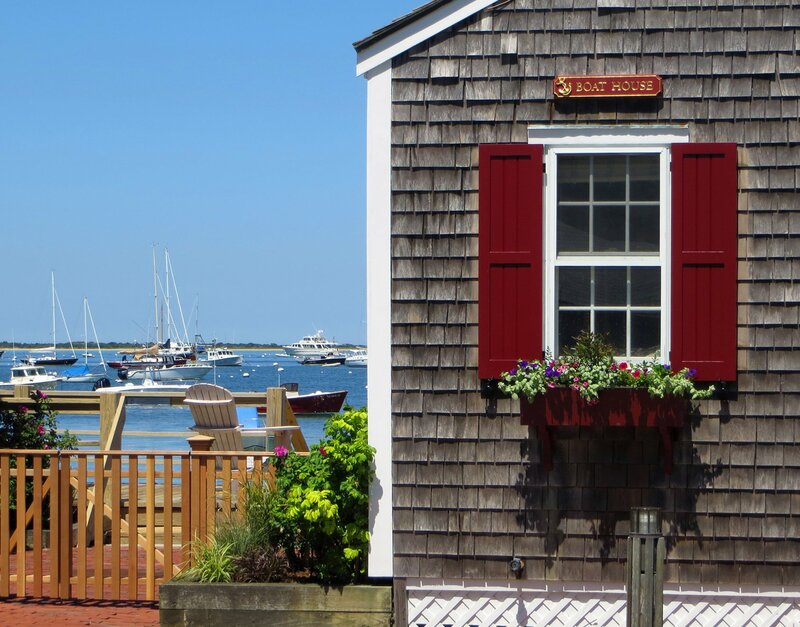 Rich red paneled shutters with v-groove details stand out against classic wooden shingles in this gorgeous Nantucket scene. 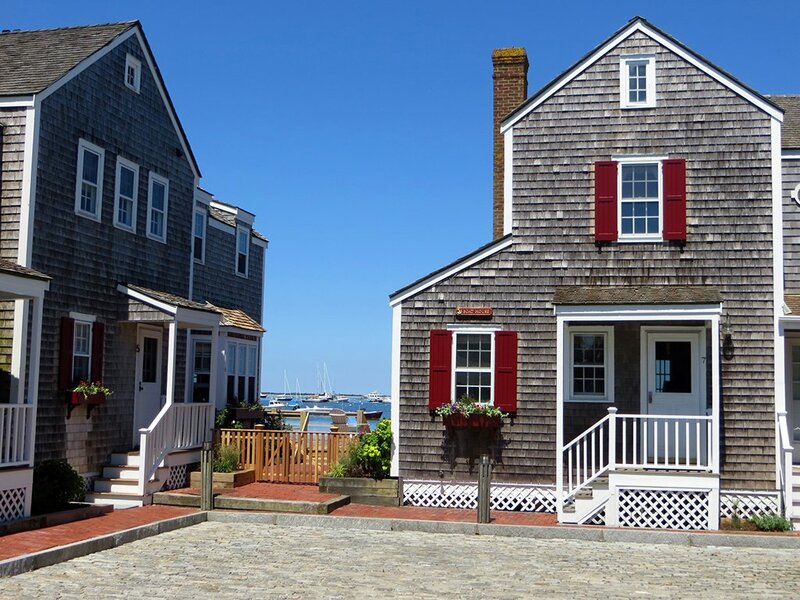 These lovely Nantucket boat houses look great with flat panel shutters in deep red. 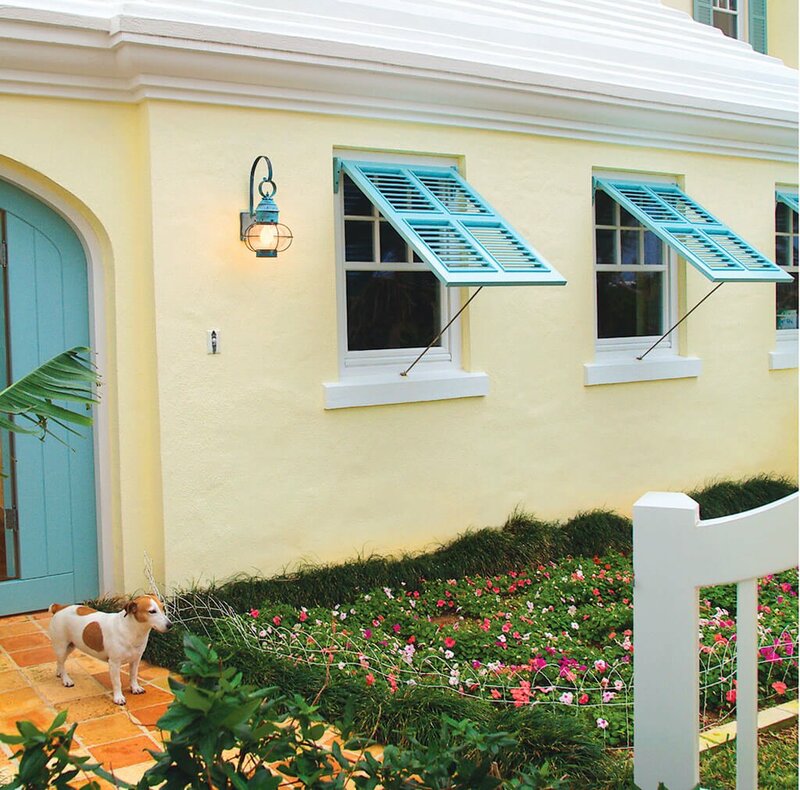 The turquoise shade of these Bermuda shutters was custom matched to make this warm façade come alive with pops of cool color. 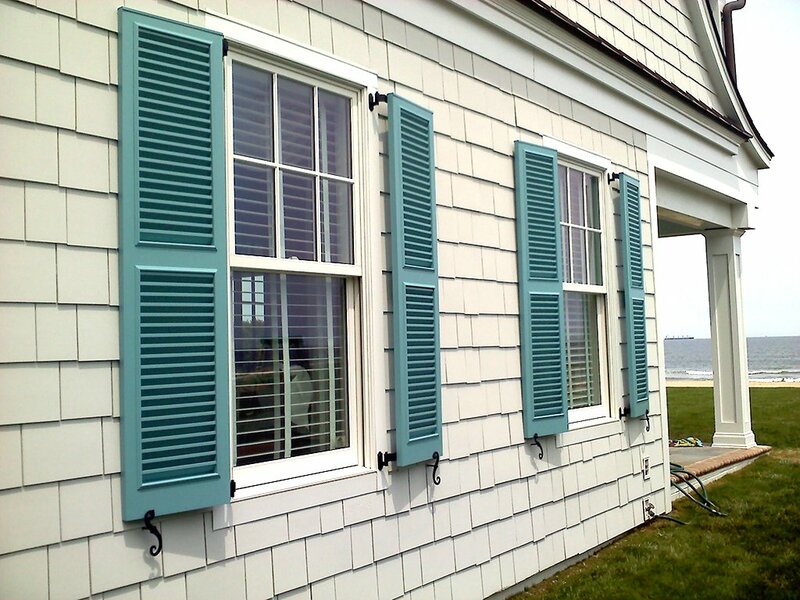 Bermuda shutters are perfect for shade, breeze, and privacy. 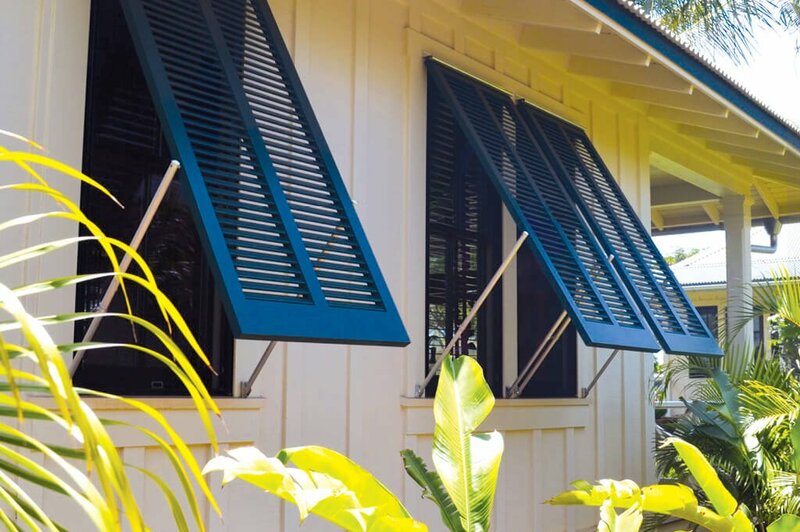 This Hawaii home features fixed louver and Bermuda shutters, both painted in Blue Lagoon. 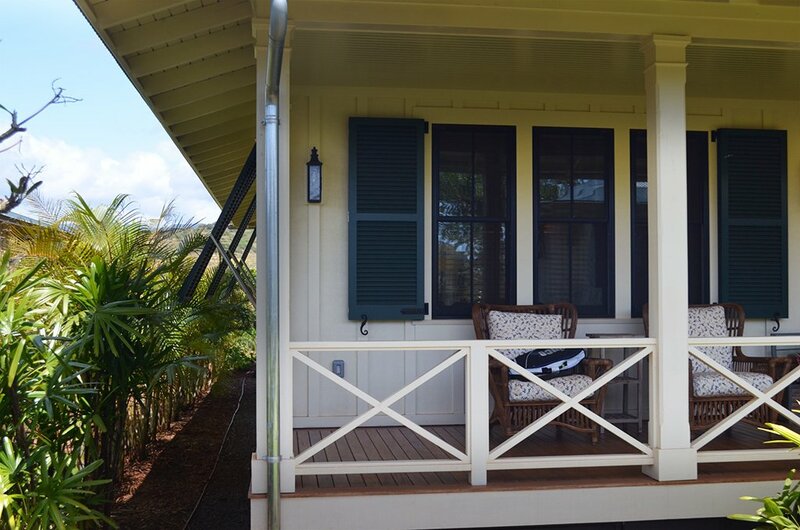 This peachy Hawaiian home is perfectly complemented with black Bermuda shutters, allowing plenty of breeze and shade at once. 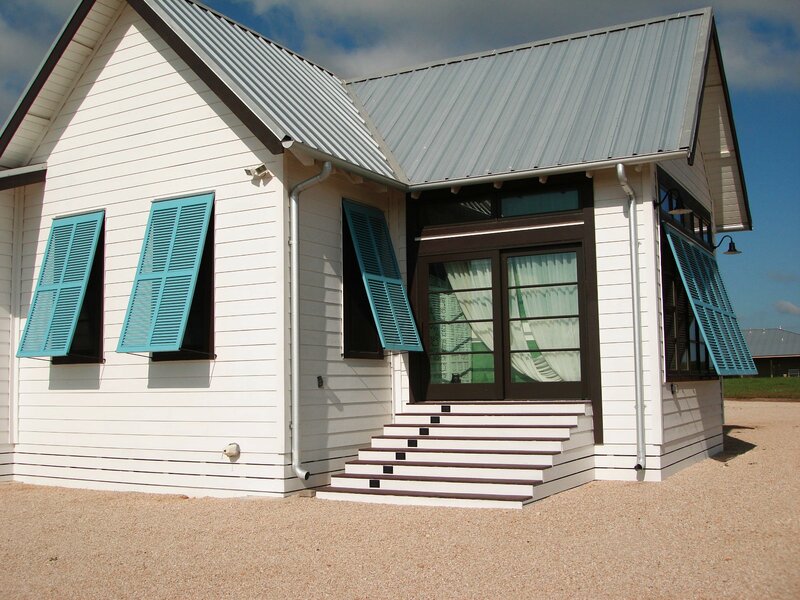 The natural wood shingles of this welcoming shore house contrasts perfectly with these fresh white Bermuda shutters. 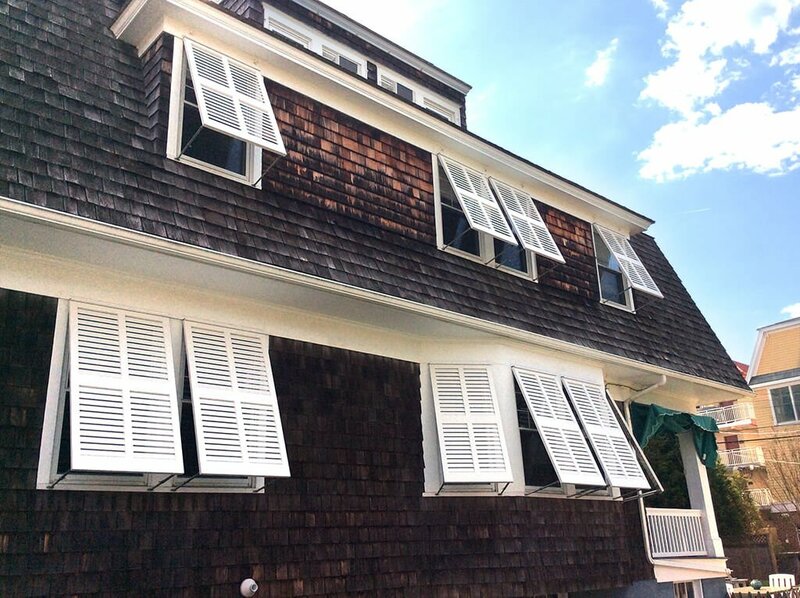 This shore house gets plenty of breeze and plenty of shade, thanks to these cool white Bermuda shutters. 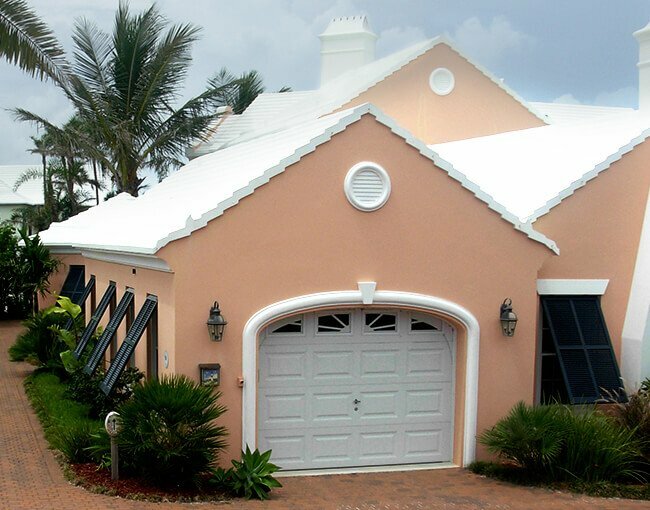 Fixed louver shutters in a 50/50 configuration, finished with “S” Beveled tiebacks and functioning hinges look right at home on this quaint, white beach house. 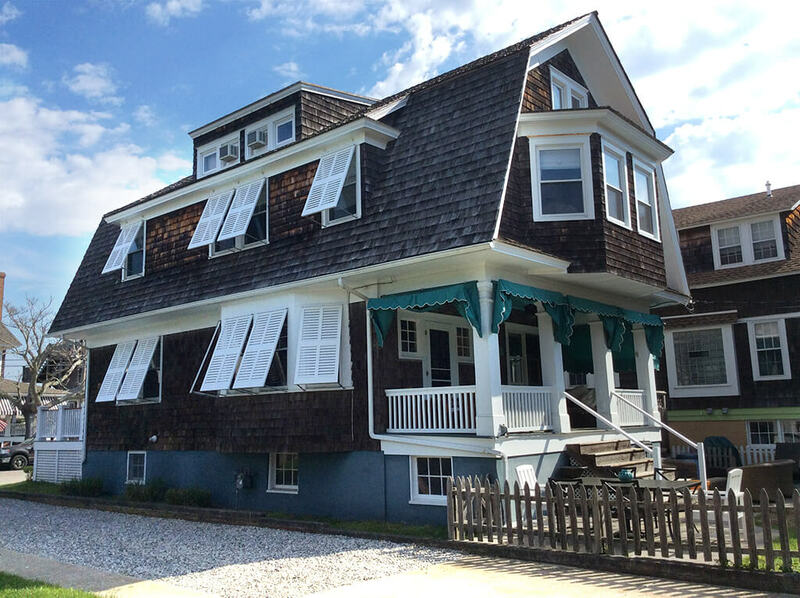 This lovely gray beach home features teal Bermuda shutters on the first floor and louver shutters on the second floor.